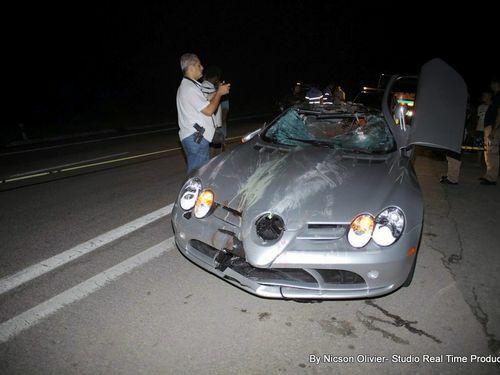 FATO: O estudante Thor Batista, filho do empresário Eike Batista com a ex-modelo Luma de Oliveira, dirigindo uma Mercedes-Benz SLR Mclaren atropelou e matou Wanderson Pereira Santos, que pedalava ou empurrava sua bicicleta na BR-040, em Caxias / Xerém , no Rio de Janeiro. The design of the callipers was specially adapted to the fibre-reinforced ceramic brake discs. Mercedes-Benz developed eight-piston fixed callipers especially for this fast Gran Turismo, allowing excellent deceleration at the front axle. The rear axle features four-piston fixed callipers. Special channels, which actively feed the cooling air to the outside of the brake callipers, ensure optimum cooling of the brakes. Overall in the Mercedes-Benz SLR McLaren there is a total brake pad area of 440 square centimetres at the front axle alone – a top value which, in combination with the extremely robust high-tech material of the brake discs, allows maximum deceleration of up to 1.3 g.
This impressive figure can be attributed in part to the SLR's adaptable spoiler – known as the airbrake – in the boot lid. If the driver steps heavily on the brake pedal, the rear spoiler rises to an angle of 65 degrees, boosting the braking effect by producing greater aerodynamic drag. 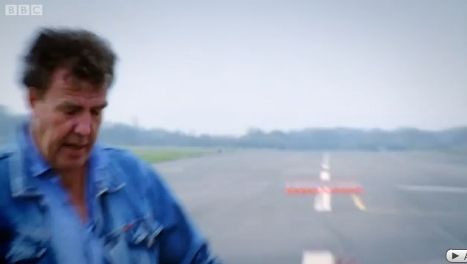 When braking from high speeds, it lends the SLR outstanding stability. The Mercedes-Benz engineers also painstakingly adapted the anti-lock braking system (ABS) and the Electronic Stability Program (ESP®) to the new brakes. ESP® was also optimised for sportier performance in keeping with the dynamic nature of the SLR. In comparison with the conventional design of the Stability Program, the SLR version forgoes automatic engine intervention in many situations, ensuring maximum propulsion without compromising active safety. 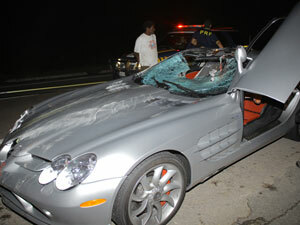 Fast driving causes many road collisions. Collisions occur when a vehicle is unable to come to a complete stop before hitting another vehicle or object. When a driver wishes to stop a vehicle he applies the brakes. 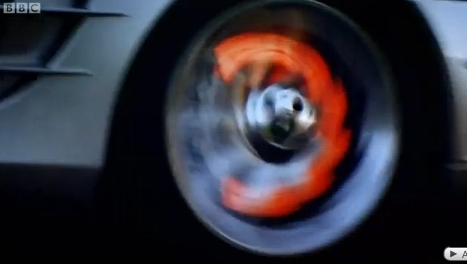 With the brakes applied, the car slows down and will eventually stop. The distance that the car moves once the brakes are applied is called the braking distance. The stopping distance for a vehicle includes the distance travelled by the vehicle while the driver reacts and applies the brakes and the braking distance. 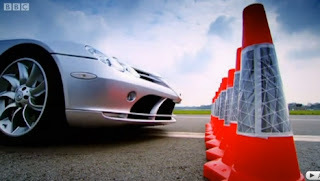 The stopping time depends on the driver’s reaction time and the speed at which the car was travelling. 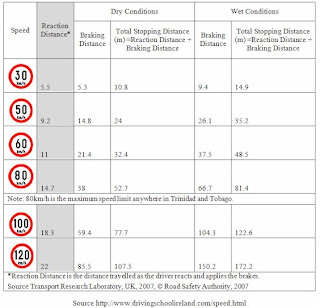 Other factors which affect this distance are the condition of the road (wet or dry), the slope of the road, that is if the car is headed up or down a hill, the condition of the tyres and the brake system of the car. 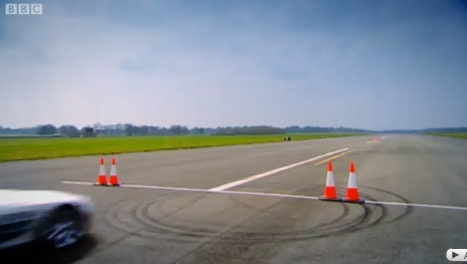 All of these factors affect the distance a car travels before stopping once a driver has decide to stop the vehicle. The faster a car is going the greater the distance required to come to a complete stop. A wet surface will increase the stopping time as will a downward slope because the slope will encourage the car to keep rolling down. Drivers are advised to keep at least a ‘three-second gap’ between cars, for safety. This means counting three seconds from the time the back bumper of the car in front passes a point to when the front bumper of the following vehicle passes the same point. For example counting three seconds from the time the car in front passes a tree until your vehicle reaches the same tree. 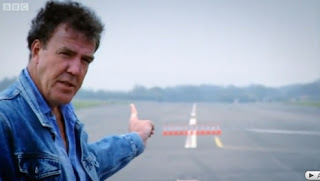 This gap should be increased in wet road conditions. This distance is critical as it allows time for a driver to react to a sudden stop by the vehicle it is following. It is also important to keep in mind that heavier vehicles, such as trucks, require even more stopping distance, so when driving behind a heavier vehicle, distance should be increased. 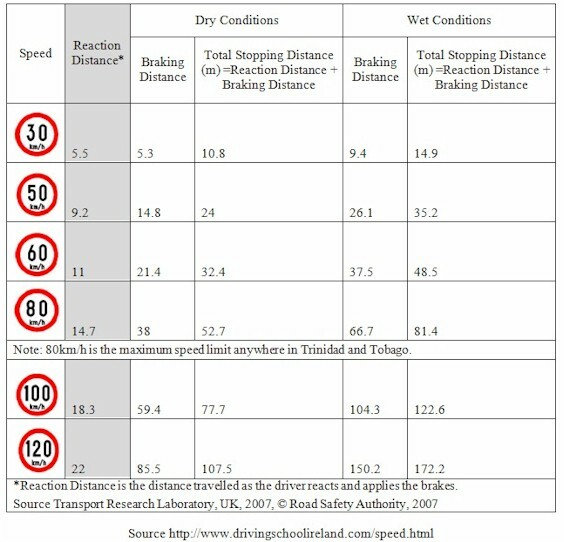 The following table shows approximate stopping distances for a car travelling at different speeds under wet and dry conditions. “8- Me recordo que Wanderson empurrava a bicicleta com o pé esquerdo no chao.”, Thor Tuitou. O que é bastante estranho. 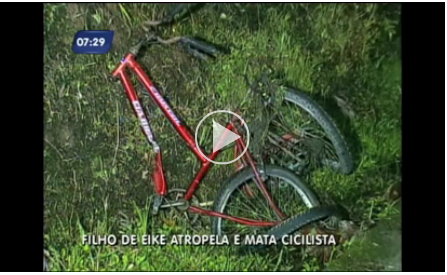 Se ele foi capaz de ver qual o pé que o ciclista empurrava a sua bike, porque ele não foi capaz de parar o carro. Em um Tuite anterior ele disse o seguinte “3 – Perto do local do acidente, nao tem iluminacao, por isso utilizava o Farol alto, farol de milha e farol de neblina. Trafeguei por ali”. We've all done it -- tried to push on through the inky blackness to make an appointment or keep some schedule, struggling to stay awake guzzling java or Jolt while fighting the 1000-yard stare. Well the safety mavens at Mercedes-Benz are rolling out a brace of new technologies in Spring 2009 on the new E-class and facelifted S-class to help reduce what the National Highway Traffic Safety Administration estimates is 100,000 accidents and perhaps 1500 deaths a year due to drowsiness. To reduce those numbers and eliminate possibly one quarter of all serious highway crashes, Mercedes-Benz has cooked up an elaborate computer algorithm to determine when a driver has become drowsy without resorting to staring at him or her via camera. Over 600 test subjects were wired up with electrodes monitoring brain function while they drove over a million kilometers with data-loggers recording terabytes of ones and zeros from all vehicle systems. The engineers were able to correlate periods of microsleep and drowsiness indicated on the brain scans with certain patterns of driver control inputs that were able to indicate drowsiness far more accurately than systems that monitor eyelid position and eye movement with cameras, something that's really hard to do through sunglasses or with glare on regular glasses. The most important of the over 70 vehicle-sensor input parameters is steering behavior, which tends to switch from active and precise steering to periods of no input followed by a jerky corrective input. After a few of these corrections the Attention Assist system lights a warning icon in the center of speedometer depicting a steaming cup of joe and says "Attention Assist: Pause!" The message can be cleared immediately -- if the driver dares. The only new hardware required for this system was a steering-angle sensor that's accurate to +/-0.1 degree (the standard ones stability control uses have a two-degree resolution). The system will be standard on the 2009 E-class and on all Mercedes-Benz models within three years. To prevent drowsiness brought on by fatigue from trying to see the road at night, Mercedes-Benz is lighting up the night with Adaptive Highbeam Assist. Turn the high beams on and a forward-looking camera mounted behind the inside rear-view mirror monitors the traffic ahead and automatically dims the lights as necessary. But this is way more than the Autronic Eye headlamp dimmers of the 1950s. Since this camera knows where the traffic is, it can adjust the lighting to illuminate as much of the road as possible without blinding drivers. So if you're slowly closing on a car in your lane, the reach of the headlamps gradually recedes to the low-beam pattern. Likewise when a car approaches in the opposite lane, the beam pattern recedes quickly but keeps the road ahead of the other car illuminated. When the road ahead clears again, the light pattern returns to the high beam pattern gradually, not suddenly, so as not to fatigue the Mercedes driver. (Instead of a shade that snaps up and down for high/low beams like on today's bi-xenon lamps, there's a more sophisticated shade that rotates slowly with a stepping motor.) Tests show that pedestrians can generally be seen as far away as 850 feet with high beams on, almost 500 feet sooner than with low beams, but most drivers only use their high beams about 6 percent of the time. Mercedes believes that by relieving drivers of the hassle of flicking between modes and sparing them the eye strain of sudden changes in brightness will boost usage to 20 percent. The system adds to the benefits of the existing Intelligent Light System, which tailors the light pattern to suit five different driving modes. Country mode (illuminates more of the shoulder on the opposite side of the road). Highway mode (above 55 mph it increases lamp output from 35 to 38 watts, and above 70 mph it extends the beam about 160 feet farther out). Enhanced fog lamps provide added illumination to the sides at speeds below 40 mph. Active lighting bends the beam to follow the steering wheel, illuminating over 600 feet more of the roadway in a sweeping turn. And finally there's the Cornering light function that comes to life when you signal or turn the wheel providing broad illumination in an intersection. But wait, as they say on late-night TV ads, there's more: Night View Assist Plus augments the current S and CL-class's infrared camera system with pedestrian recognition. An infrared camera next to the visible-light one picks up infrared reflected back from beams located in the headlamp clusters. In addition to projecting this image on the reconfigurable dash display, the system interprets the scene and highlights pedestrians to make them easier to see as the driver glances down at the display periodically. The system will be optional in 2009 on the new E-class and facelifted S-class, again at an as yet undetermined price. Drift out of your lane and Lane Keeping Assist will vibrate the steering wheel to discretely alert the driver. Unlike the officious Infiniti system, however, this one butts out when the driver is motoring briskly and clipping an apex or two. If combined with Blind Spot Assist, such a lane drift would result in a red warning triangle blinking in the mirror on that side if there was a vehicle nearby in either adjacent lane. Of course, if you're determined to ignore all the warnings and actually fall asleep, there's probably no better vehicle to wake up in (suddenly) than a new S- or E-class loaded up with Distronic radar cruise control, which works with the PRE-SAFE Brake system to alert the distracted or dozing driver of trouble 2.6 seconds before impact, a second later it applies 40 percent braking, pre-tensions the seatbelts, starts closing window and sunroof, etc. Finally (this part is new) the system gives max braking 0.6 second before the inevitable, reducing impact velocity dramatically. Of course, during the big bang there's the cushioning protection of seven or nine airbags (knee, and front seat pelvis bags are the latest, rear side thorax bags are optional on E and S-classes), plus the option of new passenger-size sensing belt-force limiters in the rear seat (the belt is relaxed more for small folks, less for large ones based on how far out the belt was wound). It's not by accident that statistics show Mercedes-Benz vehicles outpacing the fleet in the reduction of deaths and injuries over time. Tests show that pedestrians can generally be seen as far away as 850 feet with high beams on, almost 500 feet sooner than with low beams, but most drivers only use their high beams about 6 percent of the time. Testes mostram que os pedestres podem ser geralmente visto tão longe quanto 260 metros com luz alta em, quase 150 metros mais cedo do que com faróis baixos, mas a maioria dos motoristas só usar seus faróis altos cerca de 6 por cento do tempo.